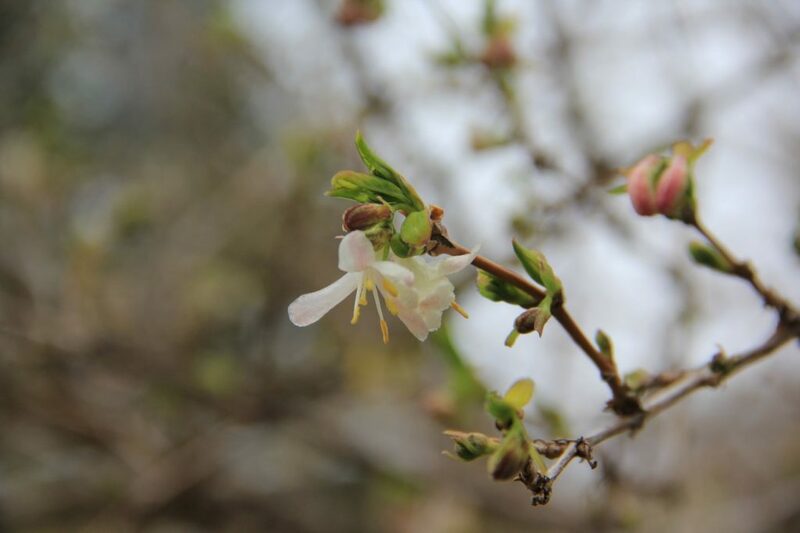 While the April sun is full of strength and warms the earth as it rises, the garden is still very brisk on a cloudy morning in early stages of spring. The wind whistles through the trees and bamboo, the birds sing throughout the canopy, and the saturated earth squishes with every step. As I walk along the garden path, the marks of spring are visible everywhere. The trees and shrubs, who have been in a deep slumber, are starting to stir. 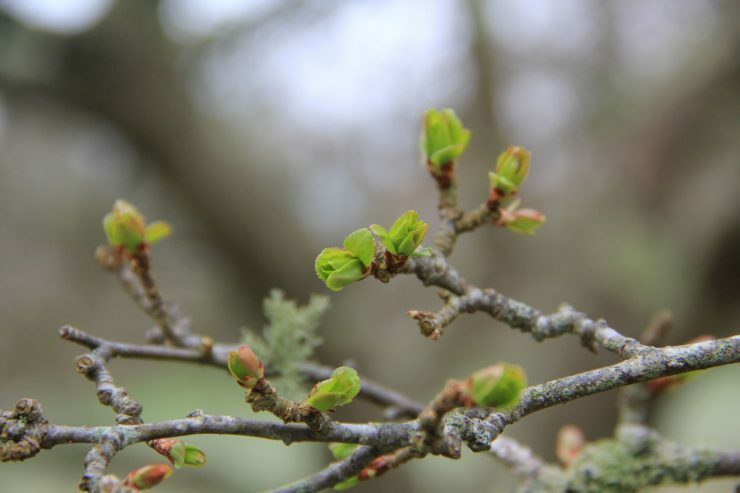 Most buds on the woody plants have begun to swell and fill with color, and some have even opened to give the forest its first speckling of green. Red Horse Chestnut (Aesculus x carnea ‘Briotii’) begining to show green between its bud scales. There seems to be a pattern among the first woodies that have decided to wake up, and it makes total sense. 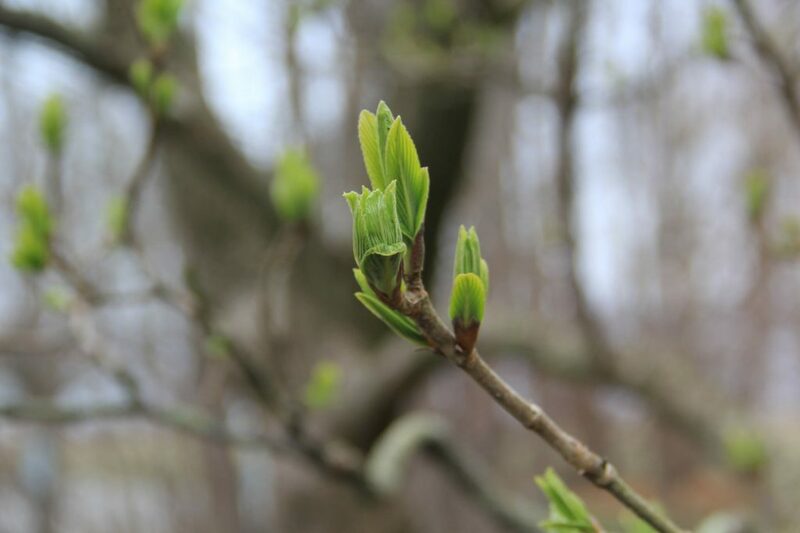 The lilacs all seem to follow a similar morning routine, with the Common (Syringa vulgaris), Pubescent (S. pubescens) and Japanese Tree Lilacs (S. reticulata) all in the early stages of leafing out. The buds of the Common and Pubescent Lilacs have begun to open and a small portion of the flower is visible. 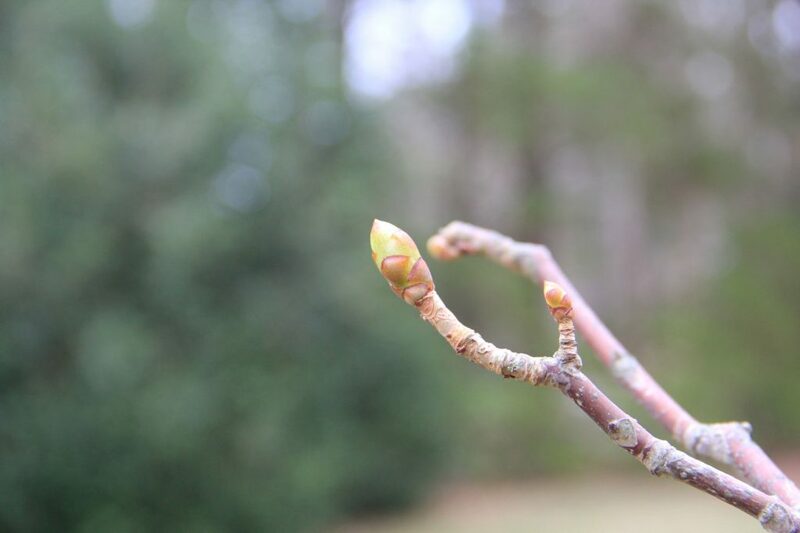 The Japanese tree lilacs have yet to open, but the buds have swollen to three times their dormant size, and the bud scales have receded to show infant leaves ready to expand and grow. 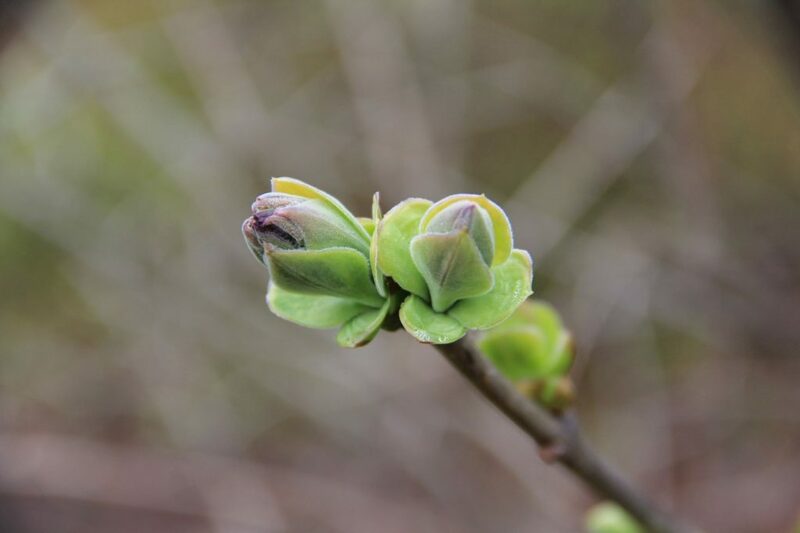 Buds of the Japanese Tree Lilac swollen and ready to burst open. A number of viburnums are enjoying the warming world as well. 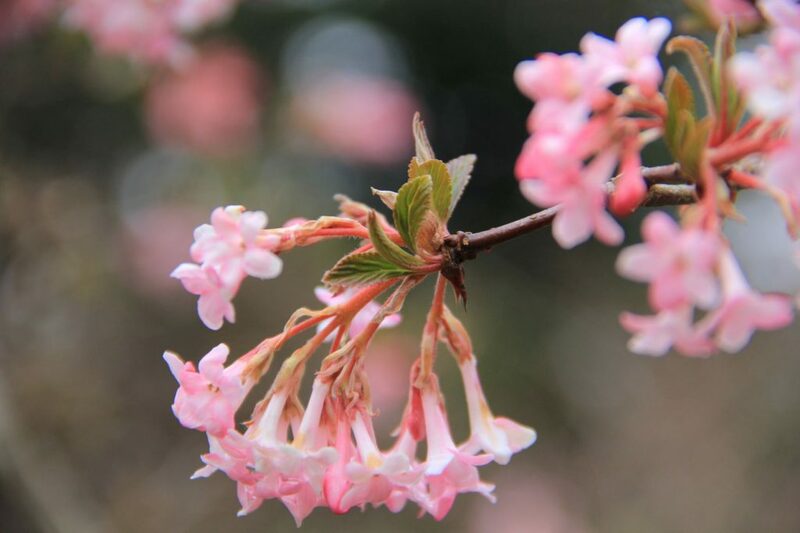 The Double File (V. plicatum), Siebold, (V. sieboldii) and Linden viburnums (V. dilatatum) are all beginning to unfold their newborn foliage, while the Dawn Viburnum (× bodnantense ‘Dawn’) is in full bloom, as it is one of the earliest viburnum to do so. Small leaves have begun to emerge at end of the stem and the base of the flower, giving the blooms good company. 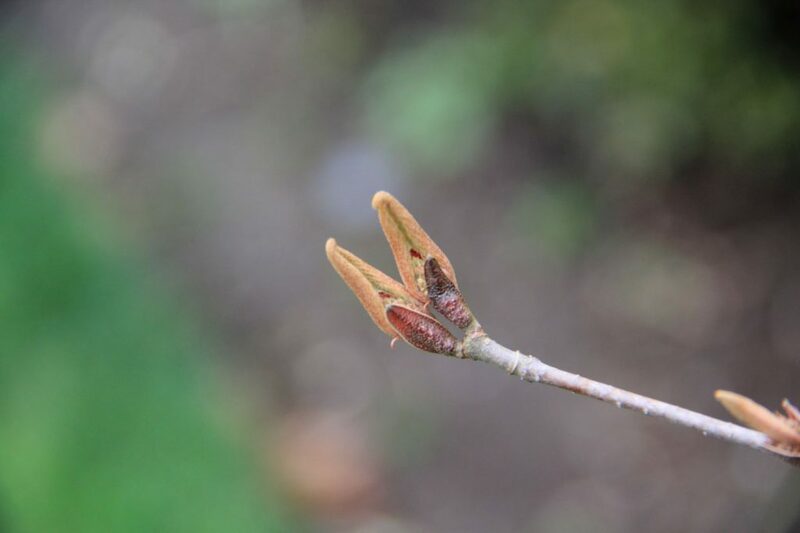 On the Double File, the buds have split apart to reveal a pair of folded young leaves taking in their first sunlight, while the large buds of Sieboldii can no longer contain the several leaves once neatly packed inside. 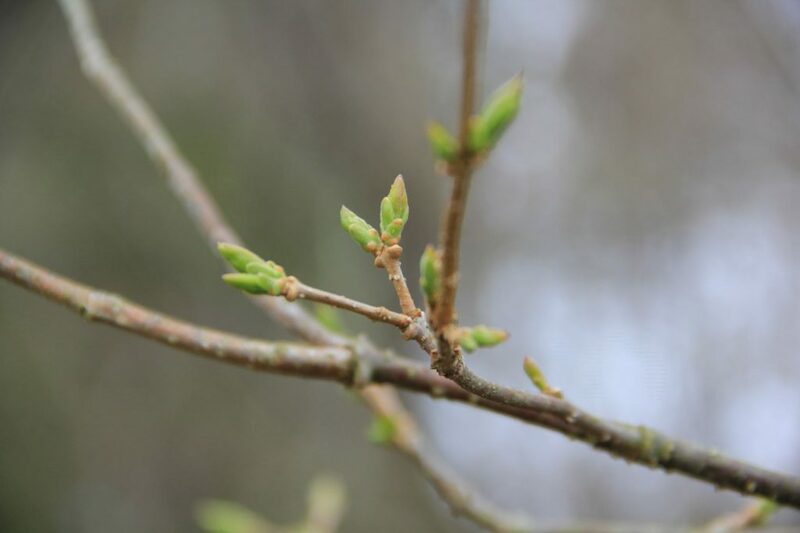 The leaves of Siebold’s Viburnum beginning to unfold. Two pairs of leaves of the Double File Viburnum catching their first rays. Other plants such as the flowering crabapple, honey suckle and multiflora rose have also broken bud, and the resilient red maples are in full flower. Some of you may have seen magnolias flowering throughout the state, but our Star Magnolia here at Blithewold has yet to unleash its beauty. Every day, the process continues, and more and more plants will awaken from hibernation. 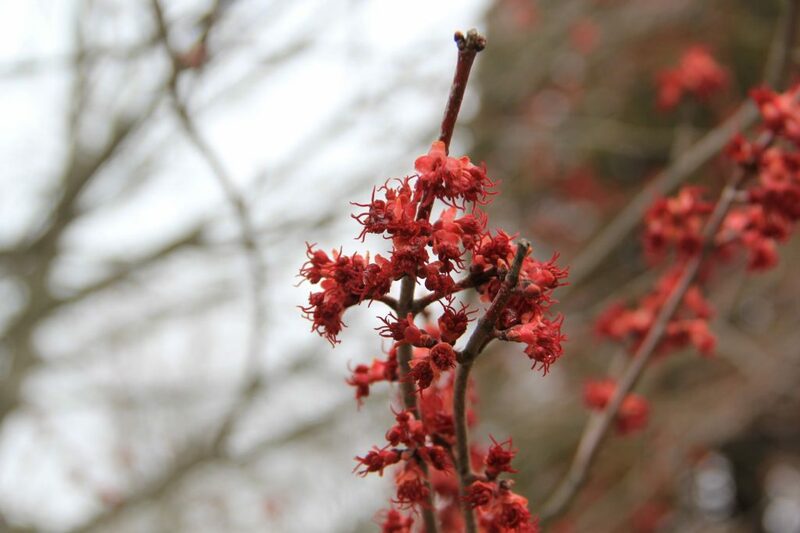 Flowers of Red Maple ‘Franksred’. If you get a chance, go for a walk through your yard or around the block, and take a closer look at the ever changing plant world during this special time of year. Fragrant Honey Suckle (Lonicera fragrantissima ‘Breath of Spring’) in flower and breaking bud.